Enjoy free parking, then choose tubes with or without bottoms, cooler tubes, and cooler/tube combos. Life vests are available with each rental at no charge. A $10 security deposits is required for coolers and cooler/tube combos, but fully refunded when equipment is returned undamaged. A free, air-conditioned shuttle brings you and your tube back to the grounds after your relaxing float. And if you are up to it and time permits, you can float again at no additional cost! Landa Falls offers an affordable, first-class New Braunfels tubing experience, look no further! The approximate float time to the Riverbahn exit is 2.5 hours, while the approximate float time to the last tubers exit is 3.5 hours. No tubes are rented after 5 p.m. daily, and the last shuttle returns at 8 p.m. Our gates close and lock at 8 p.m.
For the comfort and safety of our guests, no pets are allowed on the grounds or shuttles at any time. An additional $2 City River Management Fee is collected on Saturdays, Sundays and Holidays. Make the most of your New Braunfels tubing vacation, choose Landa Falls! Want to know more? Check out our FAQ. PERSONAL EQUIPMENT IS ALLOWED MONDAY-FRIDAY. COST IS $10/PERSON AND SHUTTLE RIDE IS INCLUDED. OVER-SIZED EQUIPMENT IS SUBJECT TO SHUTTLE RESTRICTIONS. NO PERSONAL EQUIPMENT IS ALLOWED ON SATURDAY, SUNDAY, OR HOLIDAYS. Landa Falls, conveniently located at the entrance to Landa Park along the scenic Comal River, offers ample FREE parking and FREE air-conditioned return shuttle service from the end of your New Braunfels tubing adventure. Rental prices include admission, sales tax, and are for unlimited floating during that day. Admission fees are required for anyone on the grounds, this includes those bringing their own river equipment and those wanting to picnic or just play for the day. Make a day out of your Comal River tubing adventure! Our beautiful waterfront picnic grounds are more than a great place to begin the longest float available on the Comal River. Pack a picnic lunch to enjoy in a scenic setting by reserving a table in our private picnic grounds. Call 830.627.1440 if you’d like to learn more about reserving a table for your outing. Reservations are only accepted for picnic tables; tubes are rented on a first come basis. 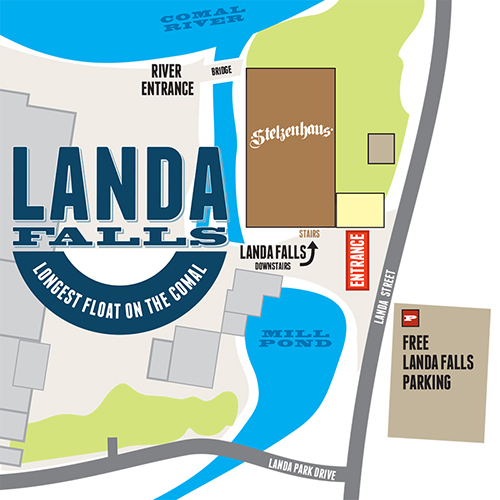 Landa Falls river outfitters is located on the banks of the Comal River at the world-famous Wurstfest grounds in scenic New Braunfels, Texas. No matter where you hang your hat, Landa Falls is your home for tubing and picnicking fun on the Comal River! Come visit us today. Note we have a new entrance! 1. From I-35, take the Walnut Street Exit. 3. Go approximately 1.5 miles on Walnut to Landa Street. 4. Turn right on Landa Street and follow it for about a mile. 5. Park across Landa Street from the Wurstfest Gate 1 entrance (look for the FREE LANDA FALLS PARKING sign). 6. The entrance to Landa Falls is on the Wurstfest Grounds and faces Landa Street. Need more information about tube rentals, picnicking or special events at Landa Falls? Or maybe you have a question about river rules or how high’s the water (Mama)? Drop us a line and one of our friendly folks will be glad to keep you informed. We look forward to seeing you at Landa Falls river outfitters: home of the yellow tube rentals and longest float on the Comal River!